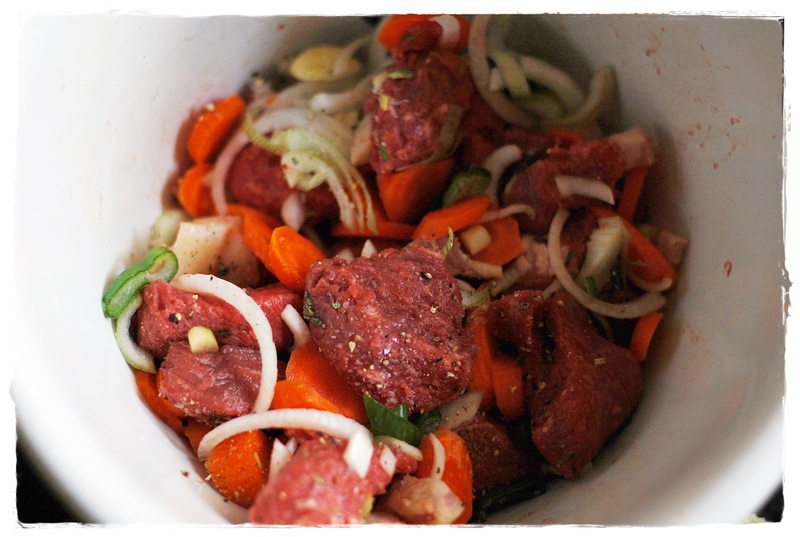 Place the beef in the bowl and mix with the wine, optional spirits, olive oil, seasonings, herbs, and vegetables. Cover and marinate at least 3 hours (6 if refrigerated), stirring frequently. Simmer the bacon for 10 minutes in 2 quarts of water. Drain and dry. Prepare the mushrooms and tomatoes. For tomatoes: drop tomatoes one at a time into boiling water to cover, boil for exactly 10 seconds. Remove. Cut out the stem. Peel off the skin starting from the stem hole. Cut tomatoes in half crosswise, not through the stem. Squeeze each half to extract the seeds and juices from the center of the tomato. Chop into small chunks. Remove the beef from the marinade and drain reserving marinade. Line the bottom of the casserole with 3 or 4 strips of bacon. Strew a handful of the marinated vegetables, mushrooms and tomatoes over them. Piece by piece, roll the beef in the flour and shake off excess. Place closely together in a layer over the vegetables. Cover with a few strips of bacon, and continue with layers of vegetables, beef, and bacon. End with layer of vegetables and 2 or 3 strips of bacon. Pour in the wine from the marinade and enough stock or bouillon almost to cover the contents of the casserole. Bring to simmer on top of the stove, cover closely, and set in lower third of preheated oven. Regulate heat so liquid simmers slowly for 2.5-3 hours. Then meat is done when a fork pierces it easily. Tip casserole and skim out fat. Correct seasoning. (*) May be prepared ahead and reheated. While the recipe says “hot or cold” I prefer it hot.